The Union Cabinet on 21 September took two key decisions regarding the presentation of the Railways and the General Budget. The decisions include the scrapping of a 92-year-old practice of presenting a separate Railways Budget and advancing the presentation date of the General Budget by the union finance minister by around 28 days. Though the final date will be announced later, the tentative date is 1 February. The Budget session usually begins in the last week of February and runs till mid-May. Till now, the finance minister presents the General Budget on the last working day of February every year. A two-member committee, comprising Niti Ayog members Bibek Debroy and Kishore Desai, had recommended discarding the British-era practice of a separate Rail Budget. "Rail Budget and general Budget will be amalgamated from now, there will only be one budget. However, the functional autonomy of railways will be maintained," finance minister Arun Jaitley said after the Cabinet meeting. The Railways ministry holds great significance in coalition governments as the position of Railways minister is usually given to a powerful coalition party. The ministers usually use the Rail budget to announce new rails and other dole-outs, often for their respective states to win the vote-bank. According to India Today, Bibek Debroy had said: Tthe railway budget is an avenue for populism with MPs demanding new trains and stops for existing ones. These decisions should be taken by railway board on a commercial basis. A lot of resources are wasted in the process of preparing it. 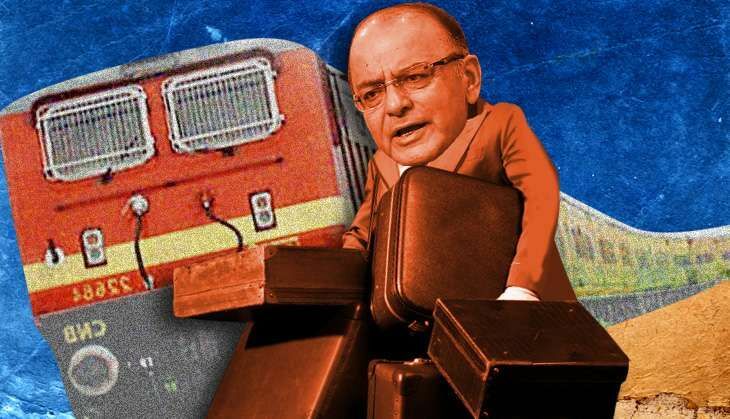 A very complicated relationship between Finance Ministry and Railways has evolved. We should simplify it". The early presentation of the General Budget would require the early completion of all the legislative approvals for the annual spending and tax proposals. This requires, advance estimates for GDP to be announced on 7 January instead of 7 February of every year. The mid-year review of expenditure by various ministries will now have to be completed by 15 November. Both houses of Parliament cleared the appropriation bill only in the second half of the Budget Session, forcing the government to seek Parliament's approval through a vote on account in March to withdraw money from the consolidated fund of India for two to three months to meet regular expenditure. In 2001, the previous NDA government, under prime minister Atal Bihari Vajpayee had changed the time of presenting the budget to 11 am, from the British era practice of presenting it at 5 pm. More in Catch - Railways: is surge pricing designed to clear the path to privatisation?